Hola from La Cuesta Encantada, which in spanish means The Enchanted Hill. But I am neither in Spain nor Mexico. Rather, I am in the unincorporated and sparsely populated area of California coastline known as San Simeon. There is one house here, however, everyone should come see if they get the chance. 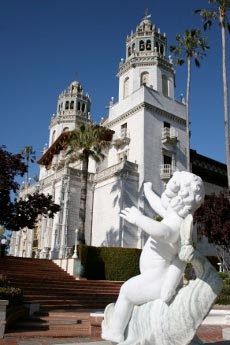 Its owner just called it "the ranch" but today it receives over a million visitors a year as The Hearst Castle. Yellow journalist and publishing magnate William Randolph Hearst commissioned the home in 1919 from San Francisco architect Julia Morgan. Over the course of the next two-and-a-half decades, one of the largest private residences in the United Sates was erected. When it was completed, the ranch was comprised of 90,000 square feet of interior space spread over three buildings. There are 56 bedrooms, 61 bathrooms, 41 fireplaces, 19 sitting rooms, 3 swimming pools, a movie theater, and even a zoo. According to the official website, Hearst introduced Morgan to the assignment by saying, "I would like to build a little something." Are you kidding me?! Today the castle is operated by the California Parks Department and offers a host of tours. I took The Experience Tour, which is recommended for first timers. You get a thorough overview of the estate and its grounds, its design and construction, and its world famous art collection. Hey, did you know that in its day an invite to come stay as a guest of Mr. Hearst was an A-list celebrity-only affair? Sort of like P. Diddy's White Party is today, sans the booze and the cleavage. Mr. Hearst, you see, was a bit more of a conservative host. The guest list was limited to twenty, and all were expected to sit down to a formal dinner each evening where drinks were restricted to two per person. David Given once commented that, "the wine flowed like glue" at the castle. I guess that was one way to keep Churchill, a noted guest, from wrecking the place. Other famous guests included Charlie Chaplin, FDR, Lindberg, The Marx Brothers, Jimmy Stewart, Bob Hope, and many more. It would seem that Hearst was the only person with the money and determination to build on this rugged section of the Santa Lucia mountains. So a timeshare rental, or any lodging, is going to involve a bit of a drive. But what a beautiful drive it is. I would suggest the WorldMark Pismo Beach Resort. It's a half a block from the ocean, has a pool and spa service, and is only about a hour from San Simeon. Right now there is only one rental listed on ReedWeek.com, but if you sign up for a posting alert, you can be notified as more become available. FYI on your visit to Hearst Castle, don't ask your guide to see Rosebud. They've all apparently heard that one before and don't find it to be very funny. Who knew?